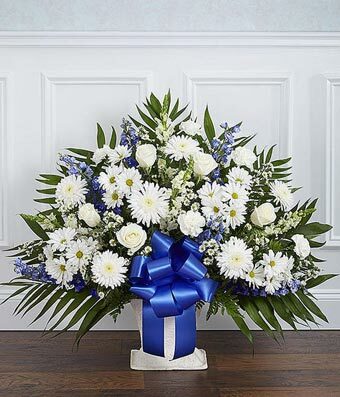 A memorable sympathy floor basket is a wonderful way to send your sympathy. Created with fresh flowers including white roses, snapdragons, white carnations and blue delphinium. Delivered in a keepsake basket with a decorative ribbon. Available for delivery today, or in a date in the future. Medium arrangement measures approximately 32"H x 40"L.